Produce hydroxide ions OH- in water. React with active metals to produce hydrogen. React with fats to produce soap. Car batteries, swimming pools, cleaning mortar off bricks and preserving foods by pickling. Cleaning products like cloudy ammonia and oven cleaners. Sulfuric acid, hydrochloric acid and acetic acid. Acids and bases were first thought as follows. An acid is a substance that tastes sour and a base is a substance that tastes bitter. eg. citric acid tastes sour. Bi-carb of soda tastes bitter or soapy. Most acids and bases however, are NOT SAFE to taste. eg. Sulfuric acid used in car batteries and caustic soda or sodium hydroxide which is used in oven cleaners. A strong base is soluble in water and is called an alkali. Alkali solutions are caustic and can cause severe burns. Alkali solutions dissolve fats and are used as cleaning agents. Examples include cleaning products containing cloudy ammonia and oven cleaners which contain caustic soda or sodium hydroxide. 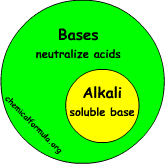 All alkalis are bases however, not all bases are alkalis. Many bases have a low solubility. The oxides of the Group I elements or alkali metals all dissolve in water to produce alkali solutions. Strong acids are corrosive in nature and dissolve active metals like magnesium, zinc and iron. examples of strong acids include sulfuric acid, hydrochloric acid and nitric acid. Soluble non-metallic oxides dissolve in water to produce acidic solutions. 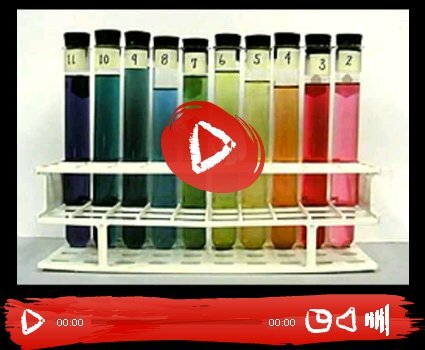 Chemical indicators are substances that change color in the presence of an acid or base. They can be used to safely determine if a substance is acidic or basic. 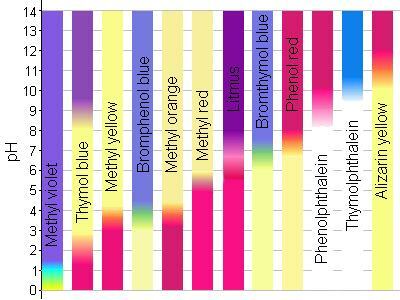 Examples of chemical indicators include litmus paper, phenolphthalein, bromothymol blue, methyl red and methyl orange. Litmus is pink in acidic solutions and blue is basic solutions.